Interactive tools for language learners have been growing for many years. Resources like apps, exchange sites, and real-time translators have been at the fingertips of students for many years now, allowing them to learn on a new level with native speakers around the world and with themselves wherever they may be. Language exchange sites have become very popular in the last ten years, as a way to acquire new vocabulary, language fluency, and cultural knowledge and meeting native speakers. From interacting with natives to engaging with learners, you now have any language within reach when it comes to resources. So, what’s the value in learning using language exchange sites? How do they work? And how can you use them to maximize your learning habits? How can I meet a language exchange partner? How do I know they are native speaking? Why is language exchange useful? Language exchange is an excellent way to improve your language skills. Connecting with native speakers has been one of the best ways to learn a language for many years, helping with fundamental elements like fluency, pronunciation, and accent. Currently, language exchange is practiced through both offline and online methods thanks to the growth of tools and resources for learners. Offline methods have been popular in the past, but many are moving to the language exchange sites online due to their convenience and accessibility. Lessons, one-to-one conversation, and meet-ups that have long been the way to learn a language, thanks to the rise of apps and online sources, are becoming less and less common. However, still valued by many who meet in person to interact around learning a language. Many people find language exchange useful as it provides you with an insightful way to perfect your language skills. Whether it’s a fluent speaker or native, they can provide real-time feedback on your speaking, writing, and understanding of a language to help eradicate mistakes, habits and further improve your day-to-day learning. Language exchange can open new doors to your language learning by providing stronger feedback than a more systematic learning process like textbooks, apps or translation technology. There’s also another layer to language exchange, the social benefits. Many people like interacting with others, either through Skype or in-person. Understanding someone’s experience with a language and culture can be very motivational and insightful for many to improve their understanding of the target language. Exchange can reveal stories and cultural insights from the target country, which will help you when traveling and discover the language in a native speaking country. Connecting with a partner anytime can be an enriching way to learn a language, especially if they are native. What language are exchange sites out there? There are various language exchange sites out there. Many of them are provided by services that help create a connection with a native speaker, whereas there are independent options like Skype coaches and individuals who can help you learn a language. Services that help connect you with others are usually more beneficial for the time-conscious, saving you time searching and starting a long-winded conversation to start the session. But they are usually a little higher in pricing than more independent learning options. iTalki is a fantastic resource for helping learners to kick-start their language exchange, whether it’s a challenge you’ve been set or need to speak with a native, iTalki provides you with a set of high-quality speakers. From Italian to Dutch, there is a great range of speakers who you can select based on ratings to help you find the best teacher for you. Book a meeting with them and pay using iTalki credits. It’s easy, fun, and hands-down a neat way to start speaking with a native speaker. Great for making a new language partner for your next learning goal. Speaking with a native speaker can sometimes be daunting, so start slow, HelloTalk provides you with an excellent platform to communicate with someone in real-time via messaging versus video chat. This way you can build up your confidence and rapport to then speak with them on video chat, in which HelloTalk provides all of the chat message. Create a group of friends and start speaking the language today. Very similar to HelloTalk, speak with natives through an iPhone app and start to practice your language with a native speaker. Meanwhile, you can exchange your skills for theirs, by teaching them some of the elements your native tongue. There’s also a web platform attached to LanguageShare, so you’re able to chat when you’re on the computer too, allowing for an always-on conversation. Partners are easy to connect with, allowing you to learn seamlessly. 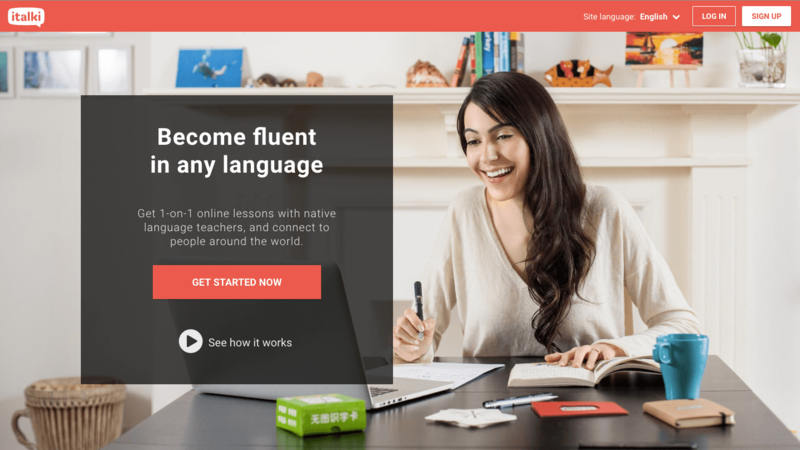 Language For Exchange offers a web-based service allowing you to connect with native speakers, easy for learners and free to get started. Once you’ve established this conversation, you’re able to exchange details and organize a trip to meet your new pen friend. The site also connects you to others for a video communication, if the journey sounds too laborious, as well as providing you with recommended language schools and other language learning services. Calling all non-English speakers? This is a great way for you to learn the English language by meeting native speakers. Providing both video and text chat abilities, users can connect with over 260,000 partners and native speakers, building up a strong network of other learners as well as teachers. It’s an immaculate service for those looking to boost their English as soon as possible. 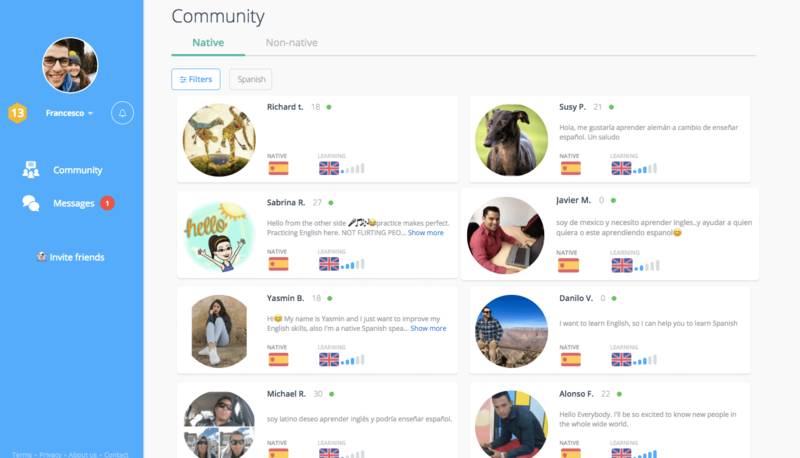 With over 100+ languages to choose from, Speaky provides you with a way to connect with others, very similar to iTalki. Connect with speakers and exchange your language skills all for free. An excellent way to get started with improving your language today, the site is very easy to use and provides a smooth experience for learning a new language, whatever it may be. Connecting with a new language partner is easy. So how should you maximize the exchange with a native or speaker? Getting started on a language exchange site can feel alien to many. There are various things to be aware of. In these modern times, you have the ability to upload a profile, bio and information about yourself from other parts of the web (e.g.,. your Twitter, Instagram, and Facebook). We can recommend a few things to do before you start connecting with your profile, to make you stand out on the service as a learner and someone who’d like to connect with you. Start by adding a profile image – a friendly photo will make you more approachable for your potential language partner. It makes you more visible when people are looking through the “online” section of the site. Make sure to pick a smiley one! Add an open bio – people like to know where you are with your learning, inform them. A simple, but friendly bio will help you keep open to new people. Make sure to add your current stage, where you are from, and how you presently learn the language. Be respectful – When you’ve managed to kick-off a conversation, that’s great! Keep the flow, make sure to approach everything with an open mind and be polite in your communication. Remember both of you are communicating a language, which should be respected. Remember you and your buddy are language partners. Once you’re on these sites, you are speaking with other people from around the world. What an honor! It’s your responsibility to keep up the conversation but also make sure your partner is happy and content with the arrangement. Don’t start too many conversations – too many conversations lead to overload. Try starting with 3-4 stronger conversations, as you’ll have to balance these conversations with learners alongside all your regular conversations on sites like Facebook Messenger, it can get mad! Find a time to suit you both – both of you in real-time can be very helpful when speaking, as you’ll get a good amount of learning done in that period. Why not try finding a time that suits you both? Remember to research their time zone based on the country they are in. Login regularly – Make sure to appear available. Logging in every 2-3 days is a sensible way to keep your language learning up. Keeping active will help you build even more rapport with your learning partner, helping to make your conversations more beneficial when they are active. Adding to Facebook – Don’t add people on Facebook straight away, some people like to keep their language learning self-private from their personal life. Always ask permission to add them on Facebook, once you do, it’s a great place to learn more about each other’s culture, but try not to outstay your welcome. Speaking with natives outside of exchange sites? Not too keen on getting involved with these online learning sites….?! No worries, language exchange still lives outside of the web. Why not try using some sites like Eventbrite, or Meet-up and check out the natural language meetups in your area. All of these sessions will help to improve your language skills, but give you one-on-one sessions on how to develop your skills. A native language buddy are your partner in crime for conquering a new language, embrace it! Many people prefer meeting in person, to help avoid awkward online connection. So why not give it a try today. There’s plenty of what to start engaging with language learner, both online and offline. Perfect for all! Do you have a language partner or native speaker who meets with you regularly? We’d love to hear in the comments below.